Sarawak is the largest state in Malaysia and is considered “The Land of the Hornbills.” Rich in culture as well as having a great mix of people including Iban, Chinese, Malay, Bidayuh, Melanau and others living in a state known for its great jungle and mountains. Since 1990, bus operator Baram Express has been serving the good people in Sarawak and has won the hearts of many who have used it. Travelers in Sarawak as well as the locals have been commuting from city to city for many years that the bus company have managed to gain a solid reputation within the bus industry. Whether you are deciding to head for a Mulu Tour at the national park or check out the adorable Kuching Cat Museum in town, you just need to book a bus ticket online through Easybook platform. Whatever you may have on your list of things to do in Sarawak, the Baram Express bus will take you there with ease once you have purchased your bus tickets. Buses will depart from the main pick-up and drop-off point at the Kuching Sentral bus terminal, in which it will travel to and back for Bintulu, Debak, Pekaka, Sarikei, Serian, Sibu and Sri Aman. Besides the mentioned destinations, you are able to make trips from Sibu to Bintulu and back with this bus company as well. Trust Baram Express bus to get you to your favourite city or town in Sarawak safe and sound. In order to provide you with a comfortable experience to your preferred destinations, Baram Express buses come with air-conditioning system to have a pleasant and cooling journey to your drop-off point. Rest back comfortably on the 41 seaters single deck buses that comes with 2+2 seating arrangements in each express bus available. You will also find televisions on each bus for entertainment purposes so you do not have to feel bored on those long rides if you decide to stay up to enjoy the show, and the gorgeous sceneries at the same time. 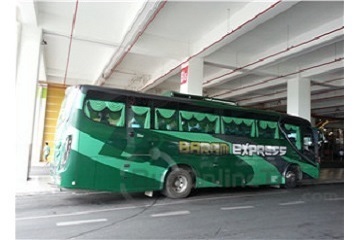 Travelling between Kuching Sentral Bus Terminal and the other drop-off points have never been made easier with such reliable service provided by Baram Express. Passengers who have booked their bus tickets with Easybook are able to relax in their comfortable bus seats and leave it to the bus operating company to take you to your stop without worries. With such great services provided by Baram Express, that is how the company managed to gain the popularity and loyal customers as they do today. It is important for the bus operator that you are in good hands when travelling around Sarawak from one city to the other. The adventure never ends in Sarawak whether you are going to be checking out the oldest heritage building Fort Alice that was first completed in 1864 at Sri Aman or witness the Rumah Nyuka Longhouse built in 1955 at Sarikei, so keep it going when you book your next Baram Express bus ticket with Easybook. Happy travelling and tell your family and friends about us too!